An epic clash of world hockey powerhouses, Rendez-Vous ’87 was a two-game series between a western team dubbed the NHL All-Stars, vs the CCCP - the best Soviet hockey could muster. Taking place in February, the NHL All-Stars led by Wayne Gretzky would take the first game 4-3, losing the return match to the powerful Russians 5-3. Hailing from that historic event, we have the Rendez-Vous ’87 ring that was presented to Wayne Gretzky, and it comes with the added provenance of first originating from the Cornish family of Rexdale Ontario, later purchased by Gretzky collector extraordinaire Shawn Chaulk. Size 8 1/2 with an approximate weight of 17 grams, the Rendez-Vous logo appears centralized on the tableau above a pair of real diamonds, encompassed by “NHLPA NHL USSR”. The inner band has been stamped “10K” along with a small “B”. As stated in the accompanying detailed signed letter of provenance from Mr. Chaulk, which is also signed by Bill Cornish, a young 15 year old Gretzky boarded with the Cornish family for two years starting in 1975, with Wayne remaining close with the family over the years. Expected wear is present from use including fairly heavy scratching throughout the band and along edges, with additional wear to the tableau as well. 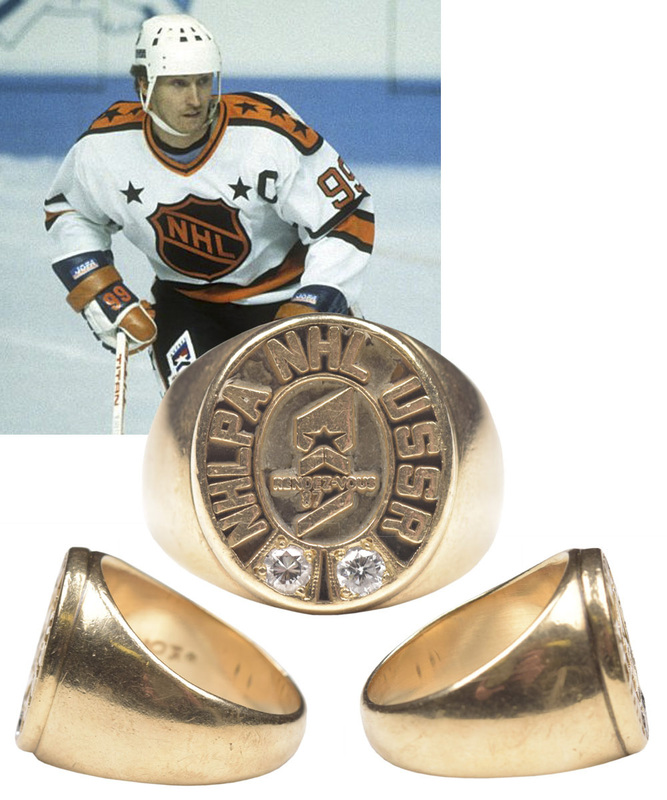 We should also emphasize how rare it is to find any genuine awards/rings from Gretzky’s career, with any and all examples highly desirable.